Another Long Walk: Stehekin, the Most Amazing Town EVER! September 16: The rain finally stopped overnight, and by morning, the skies had cleared. And... Stehekin! 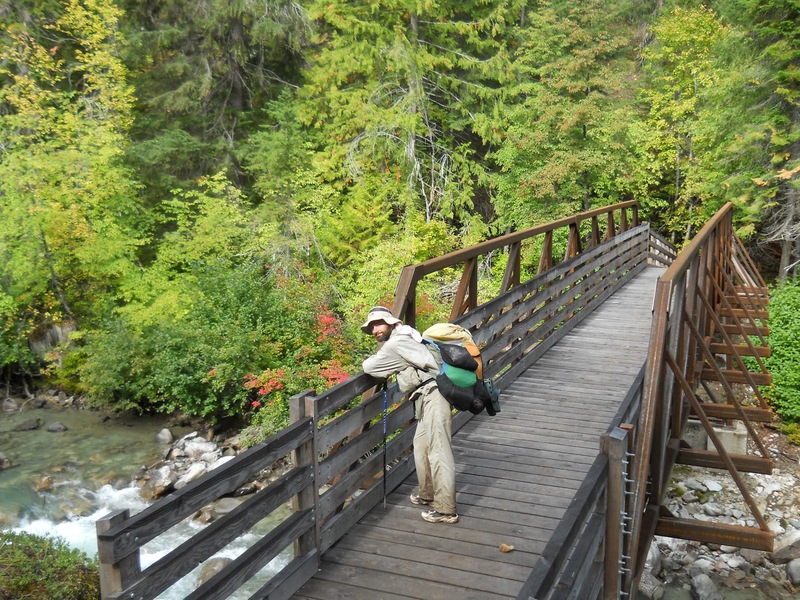 I had about 12 miles to hike to reach High Bridge and catch the bus to Stehekin. The last trail town. Canada was so close, I could practically taste it. As much as I enjoyed the PCT, I was more than ready to finish and return to the real world. The bus from High Bridge to Stehekin only ran a few times each day, so as anxious as I was to get into town, I didn't rush to get out of camp either. I'd either have to leave well before sunrise to catch the first bus, or linger and take my time for the second bus. I chose to linger. A few miles into my hike, The Graduate caught up with me. It was good to see another familiar face. I had been wondering what happened to him. 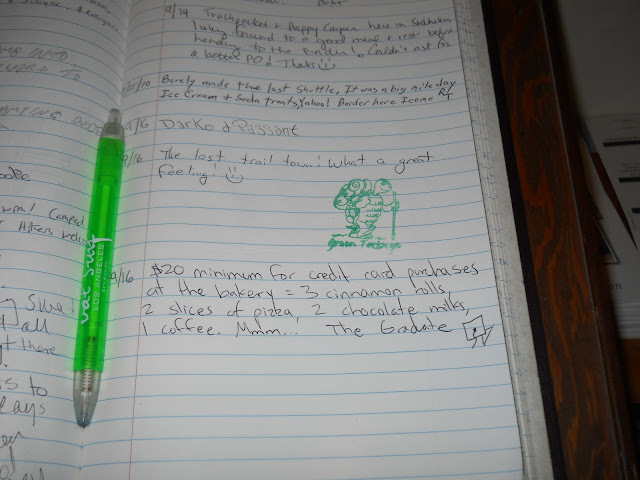 I knew he had planned to get off the trail long enough to hike the 93-mile Wonderland Trail around Mount Rainier, but saw in a register that he decided to put that idea on hold. So I hd assumed that he was long far ahead of me. How did I get ahead of him? As it turned out, he took a week or so off at his parent's place near Mount Hood providing trail magic. Sheeze, he takes over a week off the trail and still catches up with me. Show off. 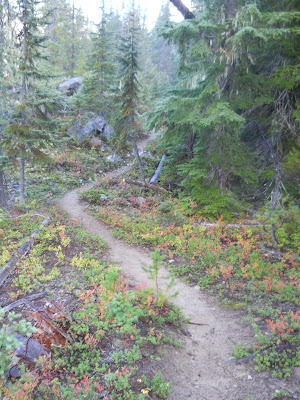 ;o) He still wanted to hike the Wonderland Trail, but Canada Fever had bit him and he wanted to finish the PCT first. 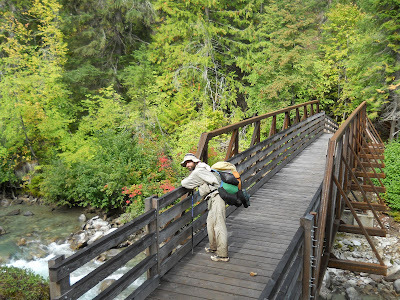 After that, he told me, he'd still like to go back to Mount Rainier and finish the Wonderland Trail. Crazy. *shaking head* I, for one, couldn't wait to get off the trail! He couldn't seem to get enough of it. We caught the 12:15 bus to Stehekin, making numerous stops along the way to pick up and drop off passengers. High Bridge was the end of the line and not many people got on the bus with us, but it grew increasingly crowded the closer to Stehekin we got. The bus also makes a stop at the legendary bakery we'd been hearing about for hundreds of miles. 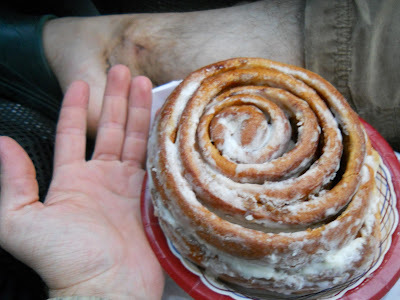 I stayed in the bus--I'm always a little leery about leaving my mode of transportation behind me--but The Graduate jumped off for a cinnamon roll along with about half the other passengers. After about five minutes, everyone was back on the bus.... except The Graduate. What happened to him? Was he buying out the whole store?! The bus waited a couple of more minutes, and finally we saw him step out of the store, loaded down with several bags of food. WTF? "It's like this," he explained. "They have a $20 minimum for credit cards. So I had to buy $20 worth of stuff." "Seriously?" This cracked me up. 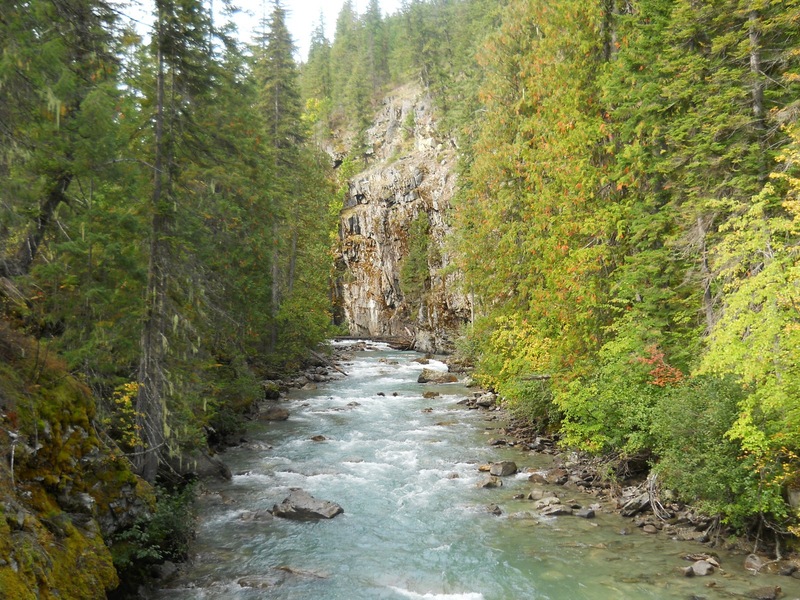 The Skehekin River, as seen from High Bridge. He had grabbed a whole bunch of stuff, and at the register, said it amounted to something like $15. So he grabbed a couple of more items. "Now how much?" he asked. "And they wouldn't let you use a credit card for a $19.36 order?" "Nope, so I had to go find something else to buy!" I guess this took a few minutes before he finally had enough to cover the $20 minimum. "Hey," he told me, "you want a cinnamon roll? I have three of them!" The bus followed the Stehekin River, a scenic little river, from High Bridge into Stehekin, but my jaw fell off when we turned the last curve into Stehekin and saw the town nestled on the side of a steep gorge holding Lake Chelan. I've heard about the beauty of Stehekin, but WOW! This one rates, hands down, the most scenic town EVER! Stehekin is an unusual little town, and not just because of the unsurpassed beauty of the place. The place is so remote and difficult to access, there are no roads to Stehekin. Absolutely none. The only way to get into this town is by boat, by plane, by foot, or by horse. Not even any forest service roads lead to this little town along the shores of Lake Chelan. There are vehicles and traffic in town (even this one bus route I took from High Bridge into town), but all of the vehicles had to be barged in on a boat. All food, supplies, and everything--it's brought in with boats. The town didn't get standard telephone service until 2007. Before then, expensive satellite or radio telephones were necessary to communicate with the outside world. The town is situated at the north end of Lake Chelan. Lake Chelan is 55 miles long, but only 1 mile wide, and is the third deepest lake in the country, nestled into a deep gorge that's kept the town so remote. got us our packages. Fortunately, it was in the cabinet right there in the post office. If it was downstairs or upstairs, she told us, we'd have to wait until after the boat came since she wouldn't have had time to retrieve it. Seems like town life is centered around the arrival and departure of boats. She had a load of mail to deliver to the boat, and had to pick up whatever mail the boat brought. is about two inches thick! The Graduate and I decided to share a room at the lodge. 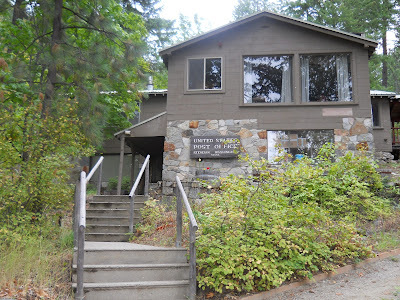 The cost was horrible, well over $100/night, and there was a campground further out of town, but I wanted a room. It was supposed to rain overnight, and I didn't want to camp in the rain. No, not again.... I wanted a nice, warm room. Dry and warm. With electric lights. So we got a room and split the cost. The rooms weren't cleaned yet, but they allowed us into their lounge to wait around until our room was ready. A couple of guys were watching television, and one of them kindly allowed us the use of his computer to get on the Internet for a short bit. I was on just long enough to read some e-mail, but nothing was urgent and I didn't reply to anything. The Internet connection was terribly slow--even dial-up connections worked better than the wi-fi available here. We finally got our room, and I started laundry going at the public laundry facilities, and mosied around town performing necessary tasks. I made a couple of phone calls from a public phone--a satellite phone--which I was relieved wouldn't cost any more than a regular pay phone. Whew. I could just imagine calling Amanda. "Hi! I made it to Stehekin! On track to arrive in Canada as expected. Gotta go because every word I say is costing me a dollar!" The most beautiful town EVER! I also bumped into Danny, another thru-hiker I hadn't seen since southern Oregon. It would have been nice to split the cost of our room with Danny as well, but Danny had already checked into another room by himself. (Yikes! He didn't even have anyone to split the cost with!) We agreed to meet later for dinner, though, and catch up. I went back to move my clothes from the washer into the dryer to discover that I didn't have enough quarters to dry my clothes. I was one quarter short. =( Oh, screw it. I don't need dry clothes anyhow! I carried the wet clothes back to my room and laid them out on lamps, the window sills, and on the bed. They weren't cotton. They should be dry by morning. 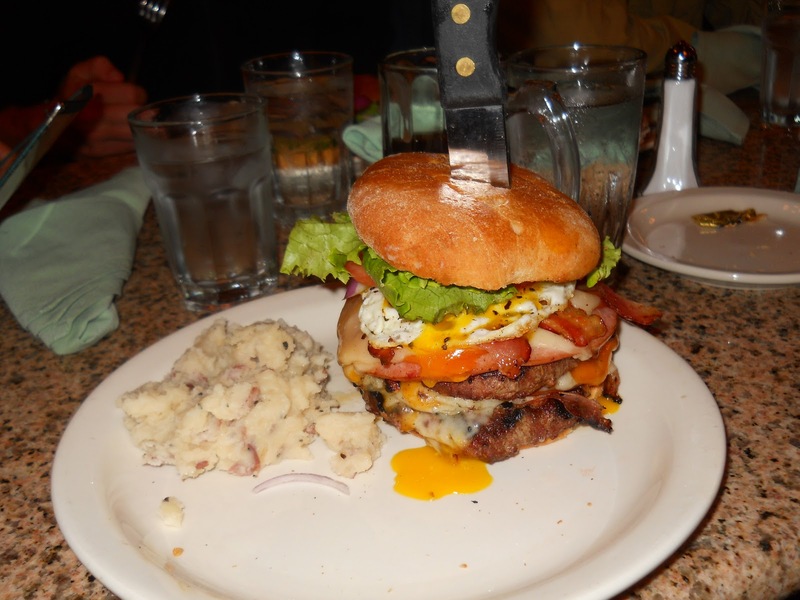 The thru-hiker dinner burger was absolutely enormous, and sadly, I could only finish down about half of it. I blamed my pitiful showing on the fact that I hiked a mere 12 miles to High Bridge that day. All the junk I ate before dinner (including the huge cinnamon roll) probably didn't help either. =) I took the rest of the burger to go to eat in the morning for breakfast. And that was that. After dinner, we broke up and went our separate ways. The Graduate and I went back to our room where we read most of the night away the books and magazines we had. The Graduate was engrossed in a book about lightning which he picked up from the book exchange at the post office. I was trying to finish my Agatha Christie book so I could leave it at the book exchange and not have to carry it the rest of the way to Canada. I had to take a photo of The Graduate's register entry at the post office. 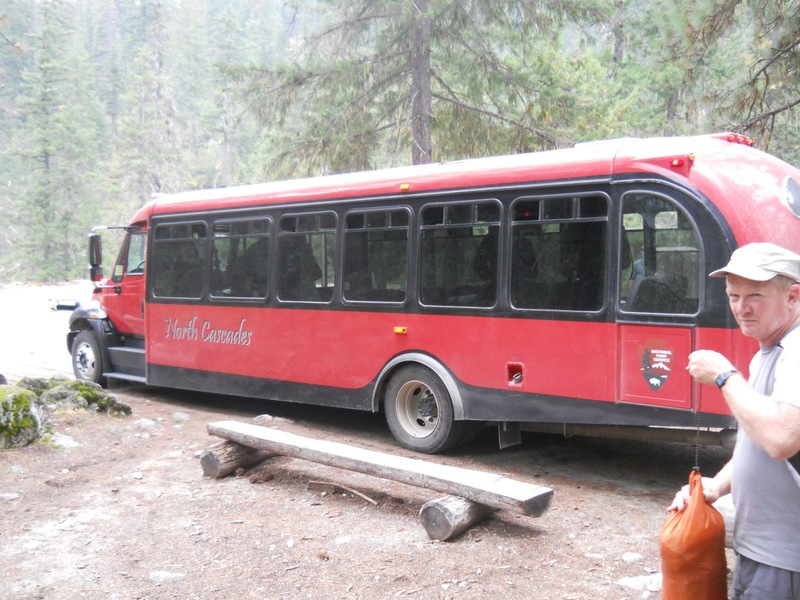 If there are no roads into Stehekin, how did you get there by bus? I thought I explained in my post--the bus would have been brought in on a boat. There are roads in and around Stehekin--but none of them connect to the outside world. It's like an island, except this town is surrounded by land rather than water, and the main way to get goods into and out of the "island" is by boat along Lake Chelan. I was expecting a great picture of the town, and all we got was a dark picture of mostly water. What's up with that? 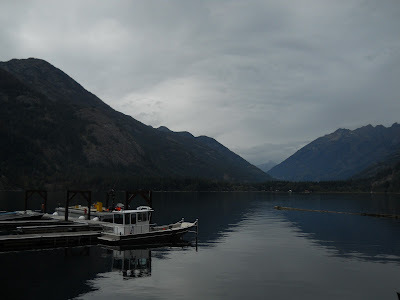 If we were to visit Stehekin (and it is definitely on the life list) we would go to Chelan, WA and then travel by ferry up Lake Chelan to Stehekin. Here is a photo online of "downtown" Stehekin. Trying to get a good photo of Stehekin is like trying to get a good photo of the Chrysler Building from the inside. Just read this from my crappy motel room (SO much rain recently! Had to dry out) in Perry, Fl and definitely enjoyed the nostalgia. Was that really 5 months ago?! PS Haven't had time to write an adequate response to your last email (lots to say re paddling the Glades) but should be back in Portland in about two weeks and'll get caught up then. I would have also liked to see more of the town and not the dark lake. Could you have taken a better photo of Stehekin as you were arriving on the boat? It would have been nice to have seen some of the buildings. The post office is adorable. But I was amused seeing how much space your stamp image takes up when you log in, especially when you don't write much. Perhaps you could put your stamp on one side of the paper and then add a few words to the other side of the image, so you leave more space for others to sign in? That sure was generous of the Graduate to give you one of his rolls. People sure have shown you a lot of kindness and generosity on your thru-hikes. Visited Stehekin to day as a tribute to my own thru hike in 1993.Still as beautifull as ever.